Brains of Tg-MBP1-EGFP mice showed globally strong endogenous green fluorescence (E) and MBP1 immunostaining (F) compared to wild-type mice (A, B). 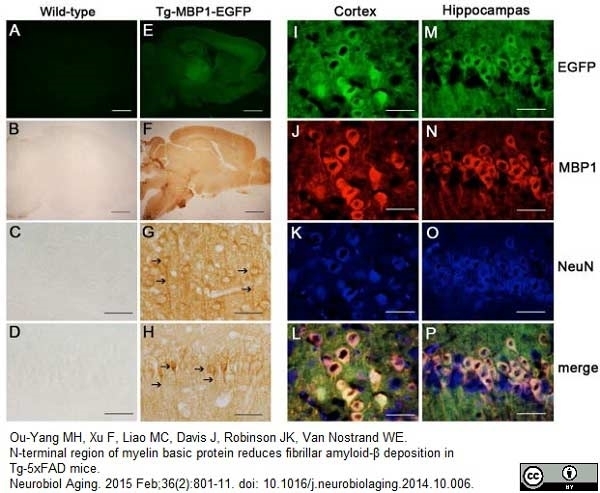 MBP1-EGFP expression was detected in the cell bodies and neurites (as designated by the arrows) in the cortex (G) and CA1 of hippocampus (H) but not in the wild-type mice (C, D). MBP1-EGFP co-localized with neuronal NeuN immunolabeling in cortex (I–L) and CA1 region (M–P). Endogenous green fluorescence (I, M), MBP1 immunolabeling (J, N) and NeuN immunolabeling (K, O) were merged in (L) and (P). Scale bars = 1 mm in A, B, E, F and 50 μm in the remaining panels. From: Ou-Yang MH, Xu F, Liao MC, Davis J, Robinson JK, Van Nostrand WE. N-terminal region of myelin basic protein reduces fibrillar amyloid-β deposition in Tg-5xFAD mice. Rat anti MBP antibody, clone 14 recognizes myelin basic protein (MBP), a component of myelin that is beleived to play a role in the myelination of nerves in the central nervous system. Rat anti MBP antibody, clone 14 has also been reported to work in western blotting (Relucio et al. 2009). Spleen cells from immunised outbred rats were fused with cells of the mouse NS0 myeloma cell line. Glynn, P. et al. (1987) Basic protein dissociating from myelin membranes at physiological ionic strength and pH is cleaved into three major fragments. J Neurochem. 48 (3): 752-9. Matsuo, A. et al. (1997) Unmasking of an unusual myelin basic protein epitope during the process of myelin degeneration in humans: a potential mechanism for the generation of autoantigens. Am J Pathol. 150: 1253-66. Friess, M. et al. (2016) Intracellular ion signaling influences myelin basic protein synthesis in oligodendrocyte precursor cells. Cell Calcium. 60 (5): 322-30. Ou-yang, M.H. et al. (2015) N-terminal region of myelin basic protein reduces fibrillar amyloid-β deposition in Tg-5xFAD mice. Neurobiol Aging. 36 (2): 801-11. Biffi, A. et al. (2006) Gene therapy of metachromatic leukodystrophy reverses neurological damage and deficits in mice. J Clin Invest. 116 (11): 3070-82. Copray, J.C. et al. (2005) p75NTR independent oligodendrocyte death in cuprizone-induced demyelination in C57BL/6 mice. Neuropathol Appl Neurobiol. 31 (6): 600-9. Jagielska, A. et al. (2017) Mechanical Strain Promotes Oligodendrocyte Differentiation by Global Changes of Gene Expression. Front Cell Neurosci. 11: 93.